Welcome. You've reached the Personal Data Pad of Booster Gold. You have security access. Booster Gold is the Protector of Booster Gold Industries and the occasional hero about Metropolis. Booster at the moment has started to pull together all his contacts in order to create a new breed of superteam. Bear with: this is done from memory after many DC revisions of Black Canary. Dinah Laurel Lance is the daughter of Dinah Drake Lance (Black Canary I) and Larry Lance (a former GCPD turned Private Investigator). Black Canary I's career didn't begin until the late 1940's (she missed being an All-Star but did join the JSA) until her heroics were cut short by her (and her teammates') refusal to unmask during Senate hearings in the McCarthy Era. Dinah Drake Lance became a private investigator along with her husband Larry (the GCPD accepted few women at the time), and had one daughter. Dinah Laurel Lance grew up in awe of her mother and her 'Uncles' (the former members of the JSA); it was therefore quite natural that she would want to become a hero. During her late elementary school years, she wold often be caught rifling through her mother's costume--much to Dinah Drake's displeasure (perhaps due to BC I's discontent, bitterness at her own career cut short, and a very overprotective urge to keep her child from harm). It was during these arguements that Dinah Jr's meta-human power (possibly due, as Dr. 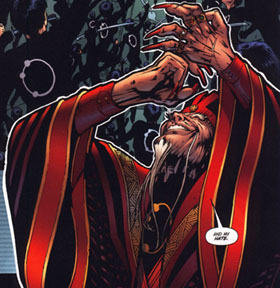 Fate surmised, to exposure from radiation from Alan Scott's Green Lantern ring): a sonic scream that had both concussive powers and a variable frequency. Things would become even more strained with the death of Larry Lance in a JSA renunion battle with a powerful alien entity (Pre-Cr. it's Aquarius the Living Star): Larry Lance sacrificed himself to save a costumed BCI. Branding her mother a hypocrite and blaming her for her father's death, she sought Wildcat's tutelage at the age of 11. At the age of 17, Dinah Laurel graduated from high school and went to Gotham University at her mother's urging. There she met and married Craig Windrow (an older returning student), and dropped out of school. The marriage lasted less than one year. Directionless, Dinah Jr. took over her mother's former flower shop . For most of Post-Crisis, it's been this way: Dinah kept her training up, working as a florist. She was directionless with her dreams of being a hero crushed under a failed marriage and a domineering mother. It was not until she read of the tales of an urban legend named Batman in the newspaper that she finally decided to become the Black Canary II. Her first mission was an eventful one: upon defeating a being of glass , she met up with Green Lantern (Hal Jordan), The Flash (Barry Allen), Martian Manhunter, and Aquaman. To defeat a covert group named 'Locus', the five banded together to form the first 'Justice League of America'. It was during this time she would meet and ... eventually ... fall in love with Oliver Queen, The Green Arrow. She left the Justice League to follow him across country with Hal Jordan (Hard Traveling Heroes) and settled down with him in Star City. She returned to the Justice League after Darkseid's ill-fated plot to crush Earth's heroic spirit (Legends), under the manipulations of Maxwell Lord (Justice League: A New Beginning). She left one year later to follow Oliver to Seattle. Dinah's years in Seattle were by far her most challenging. In her first week there she was taken hostage and cruelly tortured, resulting in the loss of her sonic cry (Longbow Hunters). While managing Sherwood Florist she kept up a part-time career in crime-fighting, assisting Green Arrow. 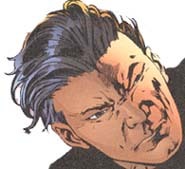 Their relationship declined when Dinah learned the same aforementioned injuries rendered her barren, as well as when she was confronted with the evidence of Oliver's infidelity with Shado in the form of a son. Dinah left him after approximately 3 years when she found him kissing the 18 year old girl she had taken into her home. She resumed her crimefighting career with a vengeance. This resulted in her home and business being burnt to the ground, and Dinah spiralling deep into debt. It took a miracle to get her life back on track. It took Oracle. 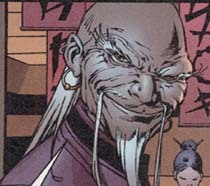 The mysterious benefactor lured her to Gotham and gave her a new look as well as a full-time job as her operative. 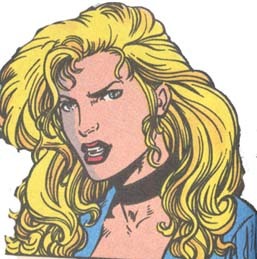 Black Canary is now a full-time 'adventuress' contracted by Oracle to function in the field. Black Canary's resources which include: Skills Contacts and Technology Black Canary is contracted on a fee basis to work for Oracle. They have developed enough of a working relationship so that Dinah has earned certain bonuses: chiefly, a credit card and a sports car. She also maintains a small apartment. 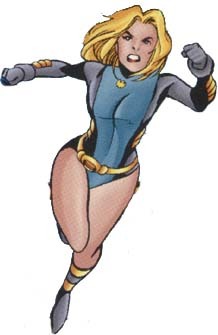 Black Canary's costume was designed and created by Oracle: the gray breast area is a thin yet resiliant kevlar, the dark blue is regular spandex, while the golden metal on the sides and arms are strategically placed to prevent too much damage to the ribs and arms when in combat. By far the most stunning feature of her costume are her earrings (which function as transmitters), and the canary charm that hangs from her neck (which has a microphone): this is relayed via 'borrowed' space on a govornment satellite. It is uncertain as to whether in the future Oracle will have visual access as well: for now she does not. It is also uncertain as to what features Dinah's golden belt may have: if any, they are known only to Oracle. 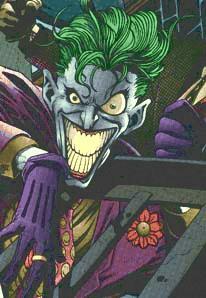 SKILLS: *Piloting: Dinah can pilot a shuttle (JLA: New Beginning) as well as a helicopter (GA). *Vehicles: Canary is extraordinarly adept with a motorcycle, and can perform hair-raising stunts with one. She is also a risk-taker with automobiles, and is an excellent driver at top speeds. *Horseback Riding: As shown in GA Annual 3 and Manhunt 4. *Florist: She has experience running a small business and can identify many common plant types. Please also see +combat. Contacts: Oracle, Oliver Queen, Connor Hawke, Eddie Fyers, Hal Jordan, as well as some former members of the Justice League. Booster's and Canary have come to trust each other on many occasions. Perhaps it was their time in the JLA that strengthened their relationship.. It is said that the sun may set in the West, but like a true enemy, the east is always looming like the coming of the sun. The where-abouts of Ishiguro Takamura are unknown at the moment. Perhaps, the greatest enemy the Outsiders have ever faced is still at Large, as well as the fact that the body of Senshi Namota went missing from the Mertropolis morgue. Little is known about the very Secretive Organization known as Takamura Industries. Currently Ishiguro Takamura is at large. Takamura is currently been discovered in the Province of Shanghai. His motives are still unknown. Black Canary appears regularly now in JLA. Costume ID: The Costume ID: Black Canary is no longer in her recognizable fishnetted costume, and therefore would not be easily identified unless it was a member of the martial arts community that had taken note of her in the past.